The NSMB Hacking Domain » New Super Mario Bros. Luigi Time! 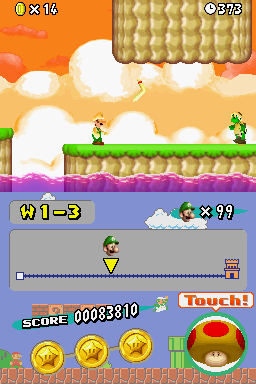 New Super Mario Bros. Luigi Time! This is a hack that I've been working on since either March or April of 2014, and has mostly been on and off as far as progress goes. That is about all that I think I have done thus far and each world's third level(excluding World 1), is planned to be a retro level, from a previous 2D Mario game, but sort of remixed and made to work with what is in NSMB. Why, thank you. I actually made the jyotyu blocks look that way as a reference to the older games, and also because the blocks from the more recent games are too detailed for me to add(except for the pipes) and would therefore screw up most of the tiles, palette-wise. I was also originally planning to change Mario to SMB/SMAS colored Luigi, but was replaced with the current recolor. While I love seeing new hacks, and I want you to continue this to completion, the levels are obvious edits. Which levels do you mean? If you are talking about 1-4 and 1-A, I can see what you mean, but the other levels are ones that I actually spent more time on, unless of course you are talking about the first video on the list, which is from before I tried my hardest to make my own levels. Did you see the videos in the World 1 So Far spoiler? Also, about getting to completion, it might be a while until I can release a demo, since my flash drive decided to go all buggy last night and switch to a RAW file system format, meaning that my files are stuck until I can figure something out. This looks good, just a few choices I'm not sure I would make, like the sunset in level 1-1. And a few edits. 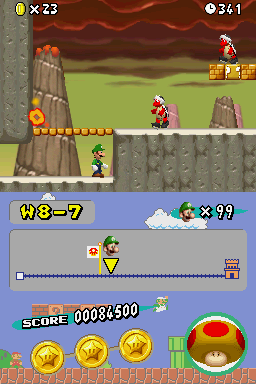 And some levels just look like the normal NSMB levels, but with a new coat of paint. How do you mean? Which levels are like this? I dont Really Know. Just, some levels gave the same vibe. Was that all? The only thing that it really retained from the original 1-A was the auto-scroll element. Nice. Do you plan on uploading it anytime soon? I plan on releasing a World 1 demo after 1-5 and other stuff is finished, as stated in the first post. 1-1: Typical first level, it's pretty good! 1-3: I have nothing to say other than the fact that the cheep cheeps are swimming in poison, which I find... Weird and kind of creepy. 1-Tower: I like the concept of going down the tower than going up it. I like the water gimmick too! 1-4: It's okay, but the music could have been better. 1-A: This level... Is awesome! I'd really wish to play it! You made the buzzy beetles black, the level is scrolling down the cave, it's foggy, there are SMB1 Goombas and plants, it reminds of SMW, the lava starts rising up, the NSMBU music port is good! What other good thing can I say about it? 1-Castle: Another awesome level! I just like the SMW and SMB1 throwback! 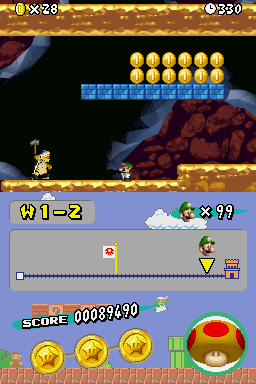 I like the part where Luigi has to go through this SMB1 Castle and meet the boss. I think it's nice and no other hacks has done that before. Well, I've got some of my files back, so now I can continue on my hack, now onto responding. For 1-3, I'm not sure why I did the cheep cheeps like that either, I guess I just wanted to add a few extra hazards to the level, and for 1-4, I couldn't think of a good music hack to put there, but it will have to do for now, and in 1-Castle, there is a secret in the first room, beyond the field of vision. Well, I've decided the official Athletic Theme for NSMBLT, SMB3 Athletic. Here is World 1-5 of NSMBLT, meaning that the hack is almost ready for a v0.1 release, however, I still have many more things to do before I release it, such as some more graphics editing, a few more music themes, etc. What about the credits to shaddow24 for the graphics? What graphics are you talking about exactly? The SMB3 ones (and maybe a fiew others). The SMB3 graphics are actually from Spriter's Resource, and I modified them in the editor to make them look like they belong in the hack, for example, when I was first adding them, the bricks were the same color scheme as SMB3(using the available colors in the jyotyu palette), but later on, I changed the colors to those of the bricks from NSMB so that they would change in different environments. In fact, most of the block tiles are from SR, like the bricks(SMAS SMB3), the ? blocks(SMW), the coins(SMAS SMB3), Pipes(NSMB2), etc. And I drew the tiles in the editor, just so that I wouldn't screw up the palette, so in reality, I used the rip as a template, rather than copy-pasting the tiles.